The top drug regulator of Sindh, accepting the request of Pakistan Vulture Restoration Project (PVRP) has slapped restrictions on the use of veterinary drugs that have long term adverse effects on scavengers that eat the carcases of the dead cattle. Vulture populations in South Asia have collapsed by over 95% since the mid-1990s. The primary cause of this catastrophic decline and an ongoing threat is the ingestion by vultures of livestock carcasses containing non-steroidal anti-inflammatory drugs (NSAIDs), principally diclofenac. As scavengers, vultures have an important ecological role and their population declines have serious consequences for humans and the environment. Their most important role is removing carcasses of animals that would otherwise be left to rot. This waste removal service controls the populations of disease-carrying scavengers and reduces hazards to human health. Although diclofenac was banned from veterinary use in Pakistan, India and Nepal in 2006, other NSAIDs such as aceclofenac and ketoprofen still pose a major threat to critically endangered vultures. WWF-Pakistan and the Hawk Conservancy Trust in the UK have been partners on the Pakistan Vulture Restoration Project (PVRP) to conserve vultures in Pakistan for the past 12 years. The project consists of a vulture breeding centre in Punjab province and a community-led vulture safe zone in Sindh province, where some of Pakistan’s last remaining colonies of critically endangered Asian White-backed Vultures and Long-billed Vultures are found. 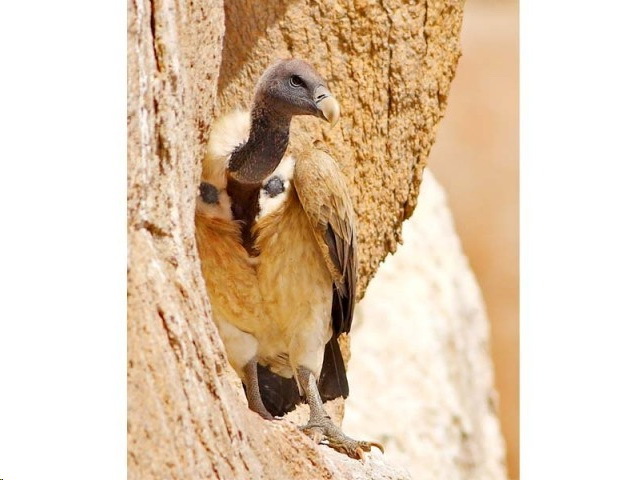 PVRP in a recent letter to Sindh Health Department urged the secretary to restrict the distribution of ketoprofen and aceclofenac in Sindh’s Vulture Safe Zone. As a result, Sindh chief drug inspector ordered all regional and district drug inspectors to restrict the use of these drugs. WWF-Pakistan and Hawk Conservancy Trust work together to deliver the objectives of PVRP.